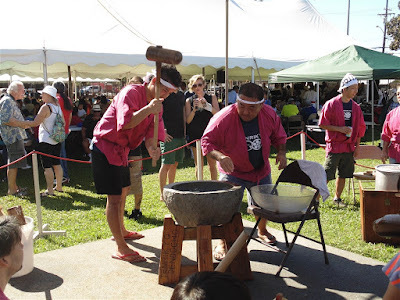 We close our our Ohana Festival series with Mochi-tsuki. This pounding of the mochi is traditional activity for the Japanese people. 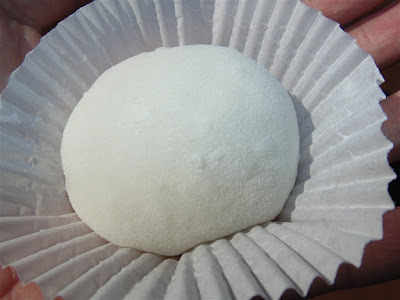 Mochi is made from a glutinous, slightly sweet rice. This reice is steamed then put in a large stone or wooden basin called an “usu” and pounded with wooden hammers called “kine”. The mochi is then pinched off into small balls of dough and filled with azuki (sweet bean paste). This demonstration showed the pounding and making of the mochi and a sample of the freshly made mochi (shown below). 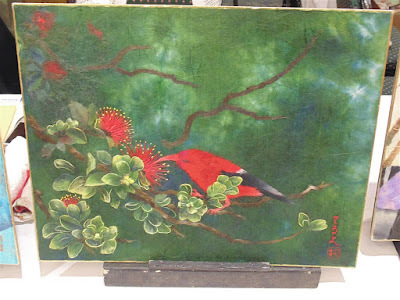 Here is another Chigiri-e artwork featuring a native Hawaiian bird. Chigiri-e is used to create either realistic or abstract images and in Japan it is popular to use flowers and landscapes. Most artists color the paper themselves using vegetable dyes or colored inks. The paper or washi is commonly made from the bark of the gampi tree or the paper mulberry. Today we feature the Japanese art of Chigiri-e. Washi (Japanese hand made paper) is used to create these masterpieces. The paper is dyed in various colors and patterns and then small pieces are torn, pasted and layered in the artwork. No scissors are used in Chigiri-e. 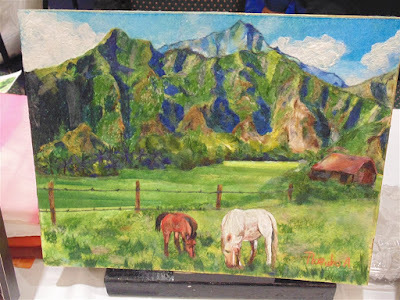 Here is a Hawaii themed one of the Waimanalo mountains and horses grazing in the fields.